It confuses me a little when people say that they don’t need New Year’s Resolutions, or that they are morally opposed to them for some reason. I sort of see them as goal-setting and a renewal of determination, which is a great thing. Look back on what you’ve done in the last year, acknowledge your accomplishments and where you’d like to improve, adjust your expectations, and set reasonably obtainable goals for the next year. This is kind of important if you really want to get things done– not having concrete goals to accomplish, and a plan for success, how are most people even supposed to get started? A year isn’t very long, but it can make a significant dent in the mountain of progress. Establishing good habits can add up to enormous success. I know that I’m probably not going to achieve everything that I want to in 2016, but since I have a handful of areas that I REALLY want to focus on, I think I’ll do reasonably okay. Two steps forward and one step back may not be the hundred steps that I wanted to take, but it’s still progress moving forward. Will I update this comic every single week? Maybe. I’m going to let myself post even crappy comics, so long as they get up here on Friday. I have to get back into the habit. Will I write every day? No, probably not. Some mornings I’m going to want to sleep in, and I bet I won’t feel like writing often enough. But I’m going to maintain that alarm that says “get up, it’s 7am, writing time!” and even if I only do it 80% of the time, that’ll be a heck of a lot more words than I’d have otherwise… and I’ve set some things in place (writing conference) to push my progress toward a deadline. Going to the gym twice a week probably sounds super weaksauce to some of you, but consider that I’m already walking 30~ minutes a day, taking my meds routinely, sleeping (or trying to) more, going to see my doctor regularly, getting treatment for lymphedema (SOON! ), and forcing myself to eat breakfast on most days. Two times a week is much better than none, especially to get back into it after so long. Heck, even if I just SHOW UP at the gym and then LEAVE I will be very proud of myself. It’s a step! Commissions… I need to finish because people have been waiting for a long time, and I don’t want there to be any resentment on either side from the stress and everything. I’ll feel so much better when they’re done, people will be happier, and I’ll be able to focus more on what I want to do! And the puppet, well… it probably won’t even be that hard to do. I could probably take a weekend and figure it out, but I’m scared, and that’s ridiculous. Once I make ONE, I will know if i want to make more and I will be able to start DOING puppetty things like I want! 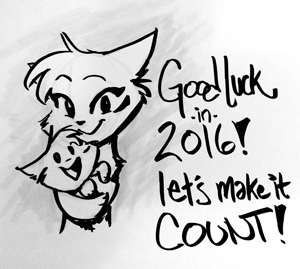 So all of that said… what do YOU guys want to do in 2016? Someone likes being chased up trees, right?